So, my only suggestion is to inspect the frame for cracks. Hopefully a crack is not the problem! I worked on one of these with the same creak. We tried some teflon tape between the slider and the frame as a last resort. It was more of a bandaid than a fix. I believe the creaking is just something you have to live with on that particular design. My new Gary Fisher Superfly SS creaks some too, I've learned to ignore it. Fixing a creak it trial and error. Did you check to be sure the surfaces of the sliders and frame that interface with each other are perfectly flat. You can use a sand block with 400 or better paper and find out. Make sure they are all flat and smooth. I posted this to a topic in the 29er forums. Basically I'm having a creak too on my Pro29. Mine, a 2010 Pro29 w/ the newest sliders is creaking. I've checked and doubled checked and then triple checked for cracks and can't find anything. I've run it SS and 1x9. I've replaced/changed out EVERY part on the bike at least once. I don't know what's causing my creak but it's beyond annoying and it seems that it could very well be the frame. It only seems to come out when I'm on the trails putting a load on the bike and once it starts it doesn't stop. Wheels, skewers, BB's, cranks, seat posts, seats, chain bolts, pedals, cleats, shoes, chain, casette, stem/bars, fork, headset, seat clamp, brake mounts, SS or geared, a 1/2 tube of Phil Wood grease AND the thing still creaks! I'm out of options and I can't/couldn't recreate the creak with the parts on my other bike. The Pro29 makes an awesome bike but I'm not sure how much longer i"m going to deal with this creak. Sadly, I have Helix road bike and have absolutely NO problems with it. My problem is just like what the OP is experiencing. It's hard to reproduce the creak unless I get on the trails. One thing I did today (the bike is setup as SS right now) was reverse the skewer. I put the locking side of the skewer on the driveline side. I haven't had a chance to test it but strangely enough, the first time ever, my rotor/disc didn't bind up and it's the free'est my rear wheel has spun. Not sure if it'll stop the creaking but at this point I'm willing to try anything. Wow you got after everything. Sounds like what I have. All my parts are brand new top of the line stuff. To get some noise out of it u can put the front tire against a door and put a small pedal push on it to make a creak. I tried putting my hand around the area as I pushed and thought I could feel the creak. Problem is it travels really well through the frame so its hard to tell for sure. I will b sure to PM u when I get further especially if we can fix it. Thanks for your help. Believe me......I feel your pain ! I look forward to your PM!. Also, I've tried the silver anti-seize and gold tie prep. I've greased the frame and every part that rubs, touches, or turns. One thing that was mentioned to me but I have no way of checking it or ruling it out is the inner seat tube. Supposedly on my pro29 (not sure if it's the same on your Ridgeline) there's an aluminum tube inside the ti seat tube. I'm told that it is is possible that it could have come un-braised. If this is the case, it was explained to me that the frame could torque/twist (as it does on the trials) and would create that annoying little creak. It makes sense but I surely hope that's not it as I can't see any way to remedy that. I think my creak is in the back with the sliders. Messing with the skewer can change the creak for me. Sadly, I've been through 4 different skewers (Shimano, Salsa, American Classic, and Crank Brothers) and I still have the creak. Some days it doesn't come on, some days it does but it will never come on if I'm NOT on the trails or racing. I changed my right side slider out with the SS slider and it still creaks so the ONLY changeable thing left on the bike is the left slider. I almost want to call Lynskey and get another but if it doesn't work, I'd literally be out of possibilities. Chain ring bolts - sometimes they can get loose, broke, or just not be right. They are pretty cheap to change out. Grease the pedal threads - self explanatory. Grease your cleat springs on the pedals. Headset - supposedly the headset can make creaking noises that sounds like it's coming from all over the bike. Fork - some forks creak there's a lot of complaints about Rock Shox stanchions. Seatposts - I've tried carbon, 2 different Thompsons, and my current Eriksen - none helped! Hope this somehow helps! Send me a PM if you ever get it figured out and I'll do the same. I have a 2010 Ridgeline SL that I have about a dozen rides on. Started creaking yesterday on some steeper stuff where I was really mashing on the pedals. I stopped and tighted the sliders as much as possible with my small multi-tool. stopped for a while then started again. When I got home, I torqued them with my torque wrench to the top end of the recommended range...If I hold the rear brake and rock the bike, I can make the same creak...thus, gotta be in the sliders or how the quick release clamps on. My next option is to take the sliders off and clean the interface surface and look for witness marks. one thing I haven't tried is to back off the small adjustment bolt (maybe it's rubbing against the slider ?) I've fairly religiously cleaned the bike after each ride with a very gentle water spray...maybe something has gotten down in the interface. I suppose the aluminum sliders could have oxidized which would also change things. It you figure something out, please post ! Man, I'm glad I'm not alone on this. I haven't made a big deal out of the creak because it seemed no other Lynskey owners were having a problem. I figured I had an issue with a part and I decided to just deal with the creak until after race season ended (Texas) at the end of May. It's July and I still haven't found my cause. Sounds like I'm not alone! I hate to hear that others are having creaks but at the same time, I'm glad because I'm out of things to diagnose and this annoyance is driving me crazy! Ray, I cleaned my sliders, no difference. I put a glaze of grease on and they still creaked. I greased the adjustment bolts - still creaks. I even tried putting anti seize between the slider and frame and still got creaks. I pulled my seatpost out on the trails and could recreate the creak. I wouldn't advise this to anyone as you don't really realize how much you use your seat until it's gone. It may be the aluminum shim in the seattube. Maybe someone from Lynskey will see this thread and help us out. Saw this post and worth a look.... http://forums.mtbr.com/showthread.php?t=635279 The creak breaks heart.......I can't live with 1/10 of that noise. I had s similar issue but it was more of a click than a creak, felt it all through the steel frame. Only happened when I rode uphill. Could make it happen like you, front against the wall. My initial though was pedals, drove me mad. After a while I decided it was the cog, got the lbs to tighten it and that click went away for ever. Hope it's something as trivial as that. Great that you fixed it. I had that on the list of checks for my mechanic because I have only been on this new bike for 3 rides. I don't even have a rear brake on it yet. Nothing much back there but a new dt swiss ss 240 hub and one isar 19t cog. First ride......no brakes at all. Straight up......walked out. 1 3/4 miles. Ranger said not to come back again without brakes ! 90% of the time, my creaks are from dry interfaces between frame/seatpost, seatpost/saddle, headset, fork/stem or stem/bar. Of course the bars on my road bike creeked for 10 years now and no amount of grease quiets it. I just live with it. I've traded emails with Mike V. over at Lynskey this morning and he suggest I use some graphite powder between the sliders and frame. I haven't personally tried this yet but it's worth a shot. Mike not only works for Lynskey but he races on their frames too so I'll give this a shot though it'll be this weekend at the very soonest before I make it back to the trails. For those that wish to try the dust, according to Mike, graphite powder should be available at your local hobby shop. Autoparts stores also carry it as lock cylinder lube. Looks like there may be an answer for the creak. Crazy 8 and his coating has stopped one bike from creaking. My sliders will be test # 2 for the fix. I should have them back by the weekend. 4 minutes to install then I will know if it works on my bike. He will be waiting for my results before doing a slew of sliders. This is gonna make some folks pretty happy I think ! When you put the rear wheel in the dropouts, is there any gap between the dropout and the axle's locknuts? Crazy 8 has my sliders for dry lube coating. It worked on another bike and my test # 2 will happen in about 5 days when they make it back. I will check the space deal when its back together. Thanks ! I had a similar creak on my bike that drove me nearly insane. I see you have a 240 hub, that was my problem, it came a little to dry from the factory and as long as I keep it greased up, absolute silencio. Give it a shot. Wow that must have been something. I have a shop walking distance from my house. The mech grabbed my wheel turned it a few times with his fingers and said nope it has grease in it. He says you just must have had a bad one. Since I have my sliders out being coated I would not want to mess with the hub anyway until it goes back together for the test. Bet you tried a bunch of things to stop the creak. My hub past the finger spin test as well. I actually considered it complete bunk when my frame builder (Steve Garro- Coconino Cycles, shameless plug) told me to check it after exhausting all other possibilities. Now I pop that baby open about once a month to keep the squelch at bay. I do think that my 240 is an anomaly, I have replaced the bearings 3 times in 6 months, one more time and it's going to the dumpster. I will definately have my mechanic look after I do the test. Thanks for bringing it up. The sliders have just been coated and are in the mail as of today. When they arrive I will post up creak test results...... ASAP ! As a matter of fact RD did mention the fact that some marking from contact from the skewers was missing making him think the creak could be related to the skewer. dontheclydsdale used many different skewers without a fix and my wheel/skewer seemed tightly in place. I think it's the slider......we see in a few days. I have a shimano skewer ready for it also for a try. My thought is it's not the skewers per se. If the rear hub's axle length is slightly too short, or the distance between the dropouts is too much, then when you clamp the rear wheel it's going to twist the sliders slightly, and a slight twist in an interface like that could cause creaking. Here is my logic. This is coming from the perspective of being a father of 3 girls and a husband. If it is creaking then something is not right. It is not supposed to do that. It is obviously the result of some inferior product design which also results in the part being heavier than other newer products out on the market. It can be a number of things/parts on the bike causing this problem. Because I am sure that it is probably caused by the part that I like the least on the bike, that means it is time to upgrade. Often it may require the replacement of several parts to get it right as they are all working together. In the end, it may be best to simply buy a new bike and start over. Just keep in mind that when you start over, you will be forced to replace some parts on the new product that don't work properly or fit you. The best bet is to go custom. 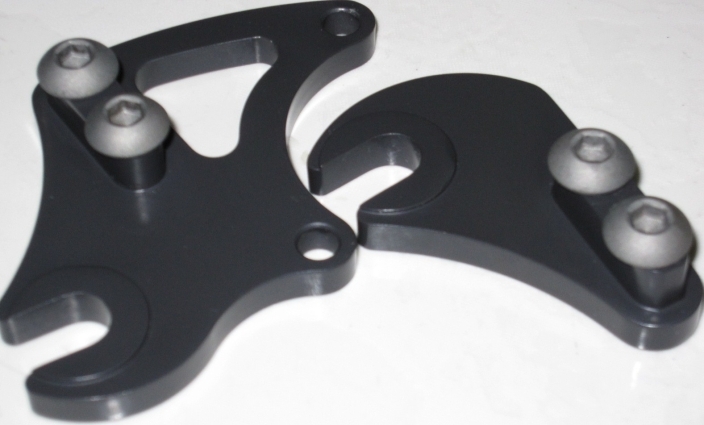 Go to the LBS and get fitted for a custom frame and make sure that the parts are compatible. Get what you know works and that is light. Yes, this comes at a price but this is what you have to do in this world. It is a viscious cycle when the mod bug bites! But oh how sweet it is when you got what you want....I mean need! It will be a few more days until the coated sliders are here. We start with the dry lubricant coating ........ something that has already worked on another creaking slider. The creak is on the hook......we just need to "reel it in". Sorry.....my uncle Stan makes fishing reels. finding a fixing a creak can be difficult. The coated slider inserts will at least eliminate them as the source. I did notice there were no teeth marks from the skewer nut on the top 1/3rd of the drive side drop out. This could very well be the source of the noise. Be sure to check that the teeth marks from the skewers is even and goes all the way around. Got a test ride in today with crazy8's ceramic coating used as a dry lubricant for engine drive trains. It was applied to the aluminum sliders. This coating has worked on another bike. In my case it looks like it was more a skewer problem than a slider problem. Using a heavy duty shimano xt skewer almost completely stopped the creaking. I am very happy with the gray dry lube coating as it looks great and makes the rear look a lot less busy back there. Others who have tried different skewers and still had a creaking problem may want to try this coating. It is a reasonably inexpensive fix try and blends in much better than aluminum. I used no oil or grease on anything and it was almost perfect. I put it all together clean and dry. I think it did help with creaking on my Ti skewers but the heavy duty skewer really stopped the creaking. At least for the first trial ride. Another longer ride tomorrow. aluminum sliders and Ti frames don't mix very well. a friend of mine destroyed the frame where the sliders fit in, in just one season of racing. the slider slot was a little rounded and there was a ton of play in the slider drops. the bike was even put together and maintained by the best mechanic in town. i feel the best dropouts for ti are track ends. All the more reason to do the coating. The ceramic coating will protect the titanium from the aluminum. Maiden voyage to the top of my favorite mountain. Stealthy and sweet ride that Ridgeline ! IMO...........Line the sliders up and get them coated ! ancient rascal, here's the pics of your coated drop out inserts. I'm glad it stopped the noise. Now you can enjoy riding your new Lynskey.............man, ain't that cool !! Last edited by crazy8; 07-31-2010 at 08:10 PM. So what exactly is the coating, or is it a trade secret? Just standard ceramic coating? dry lube. No secret, it's used in performance engine internals, valve-train, cylinder walls, piston skirts, transmission, gears,.................. the ceramic material used is tungsten disulphide, super low friction, very high wear resistance. Cool. I had a look at your website and thought it might be that one. I have a mate who's just ordered a Lynskey Pro29 and I hope he doesn't have the same problems, but if he does, I know how to get it fixed. Crazy8........Are there any choices of colors for the dry lube coating ? That grey does blend in well with the satin color of my Ridgeline. Maybe for the pink Lynskey's out there, eh ? It's been a fix for 2 Lynskeys or rather Paragon slider drop outs. Lynskey told ancient rascal to take the slider apart and apply graphite to everything, sounded messy and wasn't permanent fix. With the ceramic you don't use any lube or anti seize on the bolt threads since they are also coated. Your friend is gonna love the Pro29. I have the 26' ridgeline exclusively for climbing and it is a featherlight at 17lbs. even with a large frame. Never thought it would climb better than my Klein Rascal but it does. 6 lbs lighter also helps I guess. Your friend is gonna love the Pro29. Yes. He's just a little excited. Have all these creaking Lynskeys been frames with a Matt Satin finish? Thank you for posting my mounted slider B mech. I appreciate your input and advice on the build of my ridgeline I would not have ended up with crazy8's trick m960 crank without seeing your crank pics. It looks like it came from the factory with the frame. When I first had creaking, I tightened up the sliders to 15 ft-lbs. However, this weekend, I could turn the creaking on and off by simply moving the axle in the drop out slightly. I had some very slight rubbing of the tire on the chainstay since I didn't have the sliders adjusted right. DUring the ride, I opened the quick release, moved the tire slightly to even up the clearance, closed the quick release and started riding...creak city. Stopped after a couple miles, moved it back (slight rubbing came back) and creak went away. Came home, adjusted sliders, and closed the quick release while pushing down on the saddle (letting the axle find its natural home)....no creak. So has anyone tried a bolt on axle as a fix or has anybody experienced this problem while using bolted hubs or even the DT RSR system? I have the same creaking problem- and I run the dt clamp dsr (or whatever its called) system. The only thing that worked for a little bit was clean dropouts coated with tons of TI Prep. I am about to just send this frame back- another poster made a great point and I believe this as well- ti prep and grease just cover up a problem. I think that the Lynskey mtb frames are not built very well but built just well enough to sell. There are tire clearance issues as well (I can barely run a 2.1 w/o rubbing they had promised a 2.3 would fit) and their sales guys (who surely make commission) should not be on the front lines helping us deal with their issues. I love the geometry but this bike has been nothing but problems from the get go. When you call or email Lynskey just gives me the old line that I am the only one dealing with this problem. Their so called workers that race have the same issues we have and just live with them. I ride a singlespeed because it's harder. My creak is pretty much gone on my 2009 Ridgeline. The dry lube slider coating and a stronger xt Q Release has the noise almost completely gone. Granted ...this is one good ride only with the changes for now. I will be getting with another mech tomorrow night to have a new longer brake line done. Of course I will have him check and advise. I have been riding with a front brake only and after tomorrow I will have more to go on. 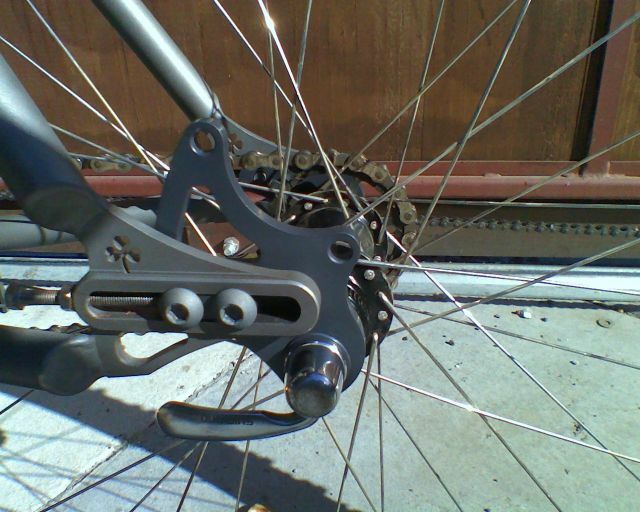 In fact, my Monica Lynskey SS with sliders has the Hadley thru-bolt. We have plenty of uphill riding here in Durango and I have not noticed any creaking. Perhaps the thru-bolt hub helps, perhaps it is something else. I helped ancient rascal source many of the lightest components available for his Lynskey build and tried to advised him that there are trade offs using super light parts. Since he weighs 150# I thought he might get away do this. The problem was using 40g weight weenie skewers. With a combination of ti frame, set up single speed, and used primarily for climbing your going to have flex, but with these skewers it was excessive. Coating the inserts only stops the creaking made from movement between the ti and al. When I received the inserts and inspected them it was obvious to me his skewer was junk and wasn't locking evenly. There were no marks from the nuts teeth on top 1/3 of the axle notch. I told the rascal to throw the junk skewers out and get a skewer that would stiffen things up. IMO the coating insulated the alum and ti, but the stiffer skewer was the fix for the creaking. Last edited by crazy8; 08-04-2010 at 09:14 PM. I have a new Kish; a fabulous bike. It is set up a single speed for CX duty with hight gear ratio 44/17. When I torque the pedal, or climb a nice steep hill it is creaking from what I perceive to be the sliders. Do you think coating the sliders will resolve the problem? If your creak comes from movement in the mechanical interface of the insert and drop out, then my answer is yes. Like I said in my earlier post you should first check that your skewers are securing the rear. This is also a fix for al to al contact points by insulating the 2 pcs, stopping the corrosion that forms. Good information here, I have the same problem with the same type of sliders, tried many of what was said here without much luck so far, some interesting ideas here. Welcome aboard ! Please share what you can. I will have more news soon to report after another mechanic doing my Marta sl brake line has a look at the slider today or tomorrow. We have a good group of mechanics and mtbr people in on this. Probably 6 mechs just from one's I have here in the bay area of California. Today's ride with the new hope skewers was much quieter but still some creaks. Since any little something can sometimes change things I will ask if anyone thinks perhaps removing a link and moving the slider, etc. forward closer to the center of the bike may help to cut down on some flex and or creaking ? Anyone already try this ?Looking at my pic in # 44 on this thread you can see it is out more than 1/2 way to the end. The creak on my bike is related to the skewer. Standard tightness more creaking ..........really tight much less creaking. hey you old rascal, need to fix that crik so we can move on to the next problem. You have the ti bolts already. I'm 99% sure, just stick a magnet on a bolt. If I'm right then torque to 28~29 nm. Maybe you should get 4 washers first. Paragon suggest this might help, by apply pressure to a larger area.. Otey.......I give the washers a try tamale after an early ride. Thanks crazyate ! I'm having the same problems and it's driving me insane. I'm reallyblooking forward to creaking my watt through the 350 miles of the TNGA (insert sarcasm here). Lynskey has offered to look at the frame but what do I ride in the meantime?? You'd think they already know what the problem is if there are this many of us with the same problems. Maybe I should have gotten that steel IF? I just ordered the complete slider upgrade kit MS0022 from Paragon. The MS0020 is less and comes with the 4 Ti bolts and double washers only. The complete 0022 kit has the upgraded adjustment screws also. 20 for the bolts only with washers. 34 for the complete kit with adjustment screws upgrade included. It should ship tomorrow and should be here in a few days as they are only 40 miles away. I will post up creak results on my threads. Did a big ride with the new Ti slider complet bolt kit from Paragon. Great news ! It is 98 % quiet and now totally acceptable. When there was a small creak from time to time is was very subdued and for most all the ride it was quiet. 1 ride only but it was 4 hrs of trail time 16 miles with 3000 + elevation gain. Tomorrow will be another big ride ...... we do Demo Forest in the Santa Cruz mountains...... ca. Gonna leave it be for now ...... go after the minimal creak later unless it fades completely away. Asking the 'Daa' question; did you grease the bolts? If not, give it a shot, if you did, try to use locktite. I had a creaking problem when applying torque on the new Paragon kit and a layer of grease did wonders. Thanks for the tip. I used the blue loctite without grease on the new kit. The deep tool friendly bolts and washers really help. I had a pretty sloppy fit on the slider so I did a light teflon tape wrap on the insert part of the slider also since it didn't fit tight anyway. Nice to just hear the sound of tire on dirt ! May order a single slider drive side only for a nice fit and try your bolt on skewer then call it a build and ride off into the sunset. Good call on the bolt on skewers doco ! I am still using an old steel xt skewer the lynskey likes better than my hope's. Would the DT swiss ratchet skewer be good or is another one better ? A ratchet style or the bolt on may be better for micro adjustments on the trail without the cam of a standard Q.Release. Maybe do test climbs on a hill and re do the hill with different tension/skewer tightness ? lynskey need to respond to their flawed design. They are not bike designers; just good Ti contractors. They can weld, have expertise in tube manipulation and access to a fine tube selection. Their plant appeared top notch. They fabricate fine frames for Salsa, On-One, Ragely, Titus, Fatback and maybe others, but when it comes to the Lynskey brand the story takes a different path. Last edited by Climber999; 08-27-2010 at 07:51 PM. They are not bike designer; just good Ti contractors. They can weld, they have expertise in tube manipulation and access to a fine selection of tubes. Their plant seems top notch. They build fine frames for Salsa, On-One, Ragely, Titus, Fatback and maybe others, but when it comes to the Lynskey brand it's entirely different story. LMAO those videos are funny. I mean, i know my video was pretty bad, but did he really just advertise "increased saddle stiffness"? Well I was out on the trail with my 09 Ridgeline today and ran into another SS riding an "on one". His creaks a bit. He knows more guys with SS bikes than me and said the creaking deal is par for the course on quite a few SS bikes due to the torque involved. I noticed that the Moots sometimes has the paragon slider and wonder if they get the creaks also. My bike is pretty quiet except on super steep climbs. The slider is a good thing for chain adjustment but maybe horizontal dropout without a disc brake would be better. The bike climbs really well and is very light at sub 18 lbs. I was gonna try the loctite seatpost shim app. next. It is totally acceptable as it is but I want it silent or close. Alright I'm back! Sorry it's been a while since I posted about my "pro29 creaking." I had a little surgery, complications, and ultimately a month off of the bike. I'm back and have had many recent outings on the bike AND I am currently creakless. Mike @ Lynskey told me to clean the sliders and use some graphite dust on them. I got some and applied it but never had a chance to get to the trails before the surgery. I finally got several visits to the trails and I have no creaking from the bike. On one occasion a slight creak started back but it was after i had removed the back wheel to change tires. I readjusted the skewer and locked it down very tightly and the creak instantly went away. I "THINK" I may finally have this creak figured out or at least figured it out for my Pro29 frame. 1. Remove the sliders, clean them, and lightly dust them (dust where the touch with the frame and bolts) when I'm doing basic bike maintenance. 2. Lock the freaking skewer down so that you almost need a cheater pipe to remove it. Probably not ideal (and I've tried MANY different skewers - currently using the Crank Brothers Split skewer) but it works. I also find that no matter what I do, I have to readjust the back brake EVERY time I take the back wheel off. The best way I have found for setting the back wheel is to put the bike on the ground (do not tighten the back wheel in the stand while the wheel is off the ground) and lock the skewer. Then go back and readjust the brake. - it's not the brake either, I've tried 3 different back brakes and several different brake mounts - currently running Formula R1's. There's what I've found. It's a extra step to clean and dust the sliders but it takes all of 5 minutes. Graphite dust is really cheap and available online or at hobby stores. Tightening the skewer causes finger fatigue but I'll take it if it means no creaking! Also it's an extra step to take the bike out of the stand, put it on the ground, tighten the skewer, throw it back into the stand, and readjust the brake but again, it's only a few extra minutes and it's worth it. With no creaking, I am once again reminded why I bought this frame - not only is it aesthetic pleasing and unique, it works with gears or as a SS, AND it's makes a great performance race bike! Does anyone else get a little annoyed when you pay between $1,200 and $3,000 for a frame and the manufacturer tells you to clean an polish the sliders and put graphite on it a few times a season to address creaking issues (that are ultimately flex issues)? I'm glad you're more open minded than me, Don. Other high end slider bikes don't have the same problems. Yes, I know there are one or two other brands that have the same slider creaking problem but by in large there aren't epidemics like the Lynskey problem. I have to say I'm disappointed in the situation and with how I've been supported by the commercial team at Lynskey. I don't think the problem could be classified as an epidemic. Until this thread came up, there was really nothing else I could find here at MTBR or anywhere else on creaking Lynskeys. Obviously, more than one person has a problem but at the same time there's a ton of Lynskey owners that aren't reporting anything but joy. I had the problem for a long time and because I couldn't find any reported issues I thought it was a part or part combo I was using. After doing 6 or 7 races, a couple hundred miles of training rides, and lots of part swaps, I'm just glad the creaking is a thing of the past and can be resolved with some basic maintenance. Again I'm not happy about having to do another piece of maintenance but if this is the only problem I can find with the frame, I'll live with it.